Today a rerun of the broadcast of November 2nd 2016 about Reinbert’s relationship with the Schönberg Ensemble. In the eighties of the previous century both parties were more and more involved in co- operation projects. 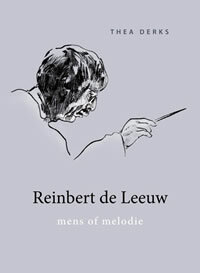 For example, Reinbert and the Schönberg Ensemble in cooperation with other ensembles founded the ‘Nieuwe Serie’ 1987. Unfortunately they had to stop after only two years due to financial difficulties. The series Proms in Paradiso from 1986 was more successful. This series was created by the Asko Ensemble and the Nieuw Ensemble. By joining together with other ensembles they were able to provide the audience with a coherent concert series with new music. Not only have there been several world premiers but people also stood up for works of the twentieth century that are now deemed ‘classic’. The Schönberg Ensemble will perform there many time even when the series moves to the Muziekgebouw at ‘t IJ in 2005. Then it will continue under a different name: Proms aan het IJ. In this series the Dutch Chamber choir is also active in the co-operation. The first series is a a cappella concert named Car nos vignes sont en fleur of Ton de Leeuw. Reinbert developed close connections with the choir and it was at his request that Sofia Goebaidoelina composed her masterpiece Nu altijd sneeuw for a combination with the Schönberg Ensemble. 1. Ton de Leeuw. Car nos vignes sont en fleur. Dutch Chamber choir led by Ed Spanjaard. 2. Sofia Goebaidoelina. Nu altijd sneeuw. Dutch Chamber choir. Schönberg Ensemble led by Reinbert de Leeuw. 3. Igor Stravinsky. From Mis: Kyrie & Gloria.